Location: Fornos de Algodres, Matança. Grid Reference: 40° 40' 04" N, 01° 35' 01" W.
This relatively small dolmen is believed to have been constructed during the Neolithic era (c. 2900-2640 B.C). 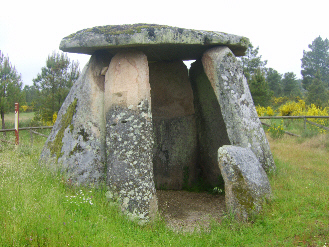 The dolmen has nine support stones, but has no corridor or evidence of a mound. It was studied by Jose Leite Vasconcelos in 1896 and finds from the site (arrow heads, stone beads, pottery, and an idol) were transferred to the Museum Etnográfico Portuguêse. Engraving (of a shepherds crook..?) 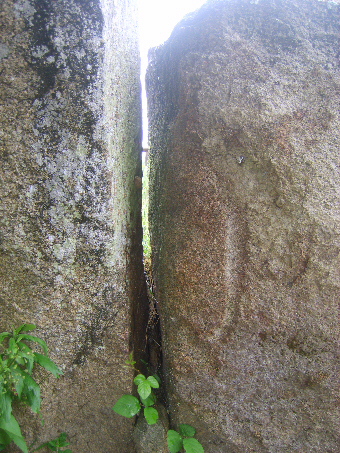 from inside the dolmen.